Lead Poisoning Deaths — Raptor Education Group, Inc. It has been a busy week with many new admissions as well as our very popular Owl-ween evening tours and education programs. I must start off with a day that caused me to take pause about our work and society. I have had time to catch my breath again, but our work in fall is "different" than the joy of raising baby birds and admissions due to natural situations like storms. It is hard to feel negative around our incredible patients. I rarely bring up that side of things to our followers, but it is part of our work. I will be back to our regular postings soon but frankly, we are all pretty upset still with the influx of illegal shootings, not only the cases below. It is a dismal time when we take 4 birds to the Antigo Veterinary Clinic for x-rays, and find 3 of the 4 were shot and had lead pellets and fragments in their body. One was a Bald Eagle, one a Loon, from Crandon, WI, Lake Metonga and one a Cackling goose from Stevens Point. Duck hunting season and Youth hunt for deer is upon us. We find it is usually not legal hunters that shoot protected species, but instead "idiots with guns". There is a distinction. Please, I implore hunters to take it upon yourselves to monitor these jerks as they are detrimental and create negative feelings with the public about hunters. And while you are at it, PLEASE do the responsible thing and stop using lead ammunition and switch to full copper bullets or steel shot. Our costs to chelate birds from lead poisoning is massive, up to $2000. per eagle and sadly we see many of them in the fall after hunting season begins. It is more than frustrating to hear that hunters don't use copper because it is a dollar more a bullet. Sadly, we lost all of the shot patients due to internal damage from the bullets combines with lead poisoning. The Bald Eagle from Rosholt found in a cattle feed lot and rescued by Mike Morgan was one of them. He had no external signs of being shot. He wasn't recovering as he thought he should. He did have and was treated for lead poisoning. We had x-rays done to investigate "silent pellets". He died just last night after a valiant fight on his and our part. The adult loon from Lake Metonga in Crandon, WI died the day after he was admitted and the Cackling Goose from Stevens Point, several days later. Lead shot and fragments inside the Bald Eagle. 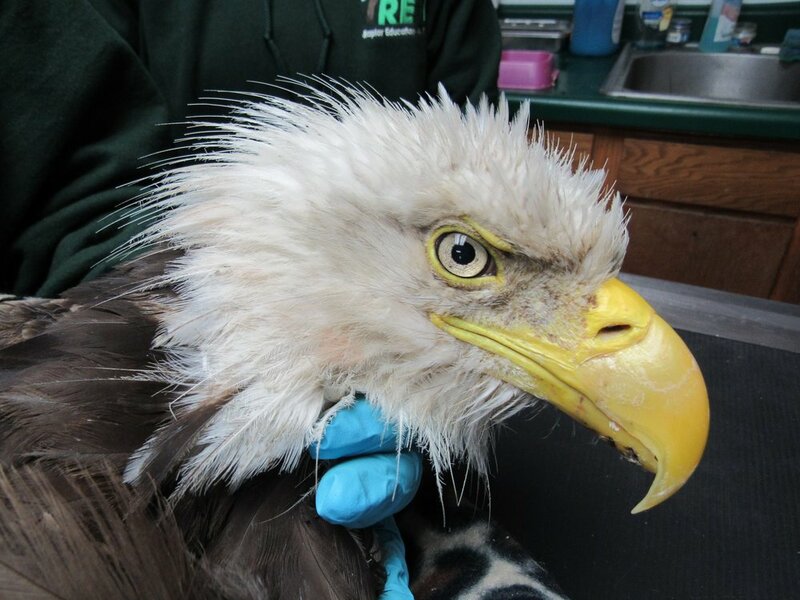 More lead in the Bald eagles upper digestive system as well as lower. Adult loon banded in 2008 has no future due to a person that chose to shoot him. Our thanks to Linda and Kevin Grenzer for rescuing and transporting the loon to REGI. Lead shows up as bright areas in an x-ray of an animals body. Keep Hummingbird Feeders UP Please!